urban boundaries, approaching regional territories. 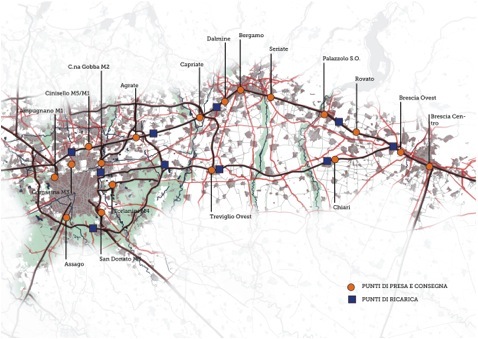 A network of available infrastructures is a key point to support EV market even in cities. Zet studies a electric car sharing model targeting companies and private users in a regional area, built up through fast and conventional charging point network. To plan a business model focused on strategic matters, organization and environmental benefits. populated metropolitan areas with daily 113.000 vehicles traffic flow. 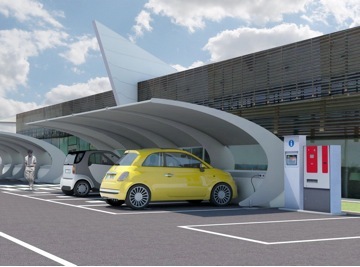 The project requires a fleet of 72 electric vehicles on a car sharing base located in 18 dedicated parking slots alongside highways stops and in intermodal points with public transport networks. 10 fast charge points will be installed in parking areas at petrol stations already existing. Overall investment (design, executions, roll out and test) is about 3.8 millions of € split in 1.8 million for fleet, 1.2 million for infrastructures charging points and 0,4 million to operational costs. Two different business model are integrated in the project, a car sharing scheme and local energy production. Environmental benefits have been estimated in 26,3tonn of CO2 reduction on a base of 168.000 km run monthly. Even comparing direct petrol costs between two mobility solutions (conventional car and electric car) the project estimates 20.160€ saving monthly within the fleet. Information Technology Company for management system and smart grid.